Hello and welcome to the 128th installment of the SWD. Improvised explosive device exploded at Firqat al-Sultan Murad’s (Sultan Murad Divison) HQ in the city of Al-Bab. Explosion killed two commanders in the group, Fayez al-Droush (Abu Hilal al-Homsi) and Abu Omar al-Nimr, both from Homs. Over a dozen of fighters were also injured in the explosion, including Abu Hamza al-Droush and Hilal al-Droush. Device which exploded, targeted Sultan Murad’s HQ for fighters from Homs, around 300 rebels evacuated from Al-Waer neighborhood reportedly joined Sultan Murad. Rebels from Al-Waer also form a chunk of fighters in Faylaq al-Sham, Al-Muntasar Biallah and other smaller groups formed in northern Aleppo. Syrian Democratic Forces are being accused of allegedly arresting 25 civilians who live in Afrin and are from SAA-held Nubl and Zahraa. This move by SDF, reportedly led to the closure of the roads between SAA-held areas and SDF-held Afrin “canton”. Ahrar al-Sham reportedly repelled SDF‘s attempt to advance on Darat Izza front. Katibat Maghawir al-Shamal (Northern Commando Battalion) joined Liwa al-Shamal in northern Aleppo, battalion is lead by Muawiya Al-Abdallah. 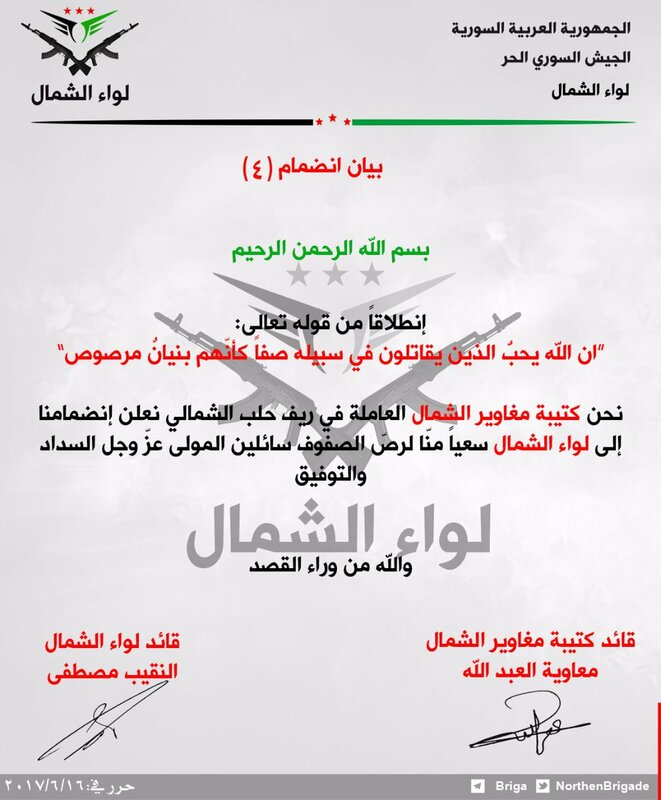 As usual, Liwa al-Shamal released a statement regarding the event, signed by the leader of the group, Captain Mustafa. Clashes are still ongoing in a number of districts in Raqqa between SDF and IS, the latter launched a counterattack in Al-Baytani district. IS’ death toll for Raqqa today is reportedly at least 30 fighters. 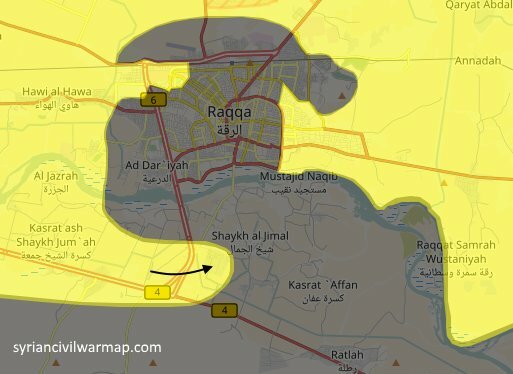 South of Raqqa, Syrian Democratic Forces captured Kasrat al-Faraj village from Islamic State. Yesterday, IS’ Amaq Agency claimed destruction of six SDF‘s vehicles in Qusra Juma village, southwest of Raqqa. Syrian Arab Army launched an offensive on rebel-held Jobar district in east Damascus. Clashes between two sides occurred mainly on Ain Terma (Ein Tarma) front, SAA allegedly made small advances. Faylaq al-Rahman, which mans the western fronts of East Ghouta reported destruction of SAA‘s T-72 tank and a bulldozer as SAA tried to advance. Northeast of Khalkhalah Air Base, SAA captured Bir Qassab area from Free Syrian Army factions. A U.S. aircraft shot down an armed pro-Syrian regime Unmanned Aerial Vehicle advancing on Coalition forces in Southern Syria, June 20. The Coalition has made it clear to all parties publically and through the de-confliction line with Russian forces that the demonstrated hostile intent and actions of pro-regime forces toward Coalition and partner forces in Syria conducting legitimate counter-ISIS operations will not be tolerated. Syrian Arab Army launched an attack west of Daraa and briefly captured air defense battalion from rebels. 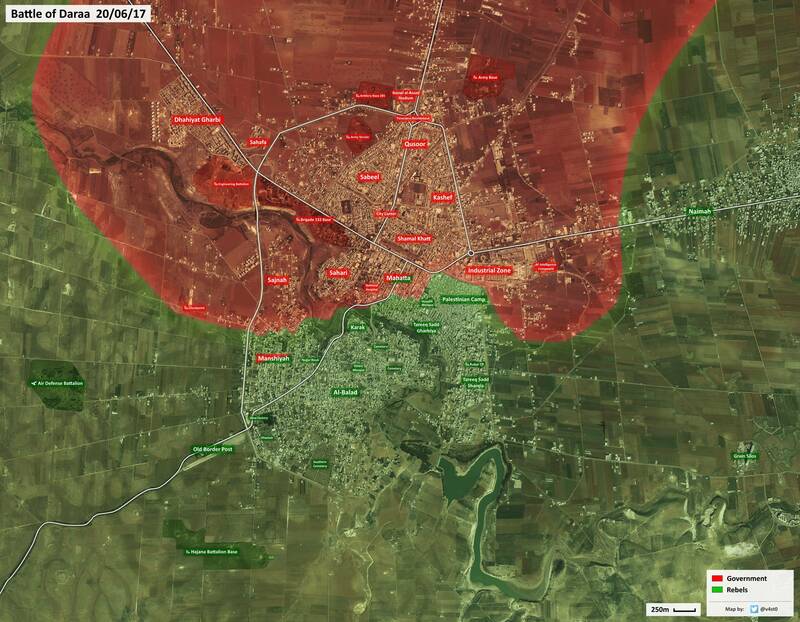 Rebels quickly recaptured the locality from SAA, the latter reportedly lost a dozen of soldiers. At least four SAA‘s were captured and one T-72 and BMP-1 seized by rebels. Rebel “Daraa Martyrs Documentation Office” reported death of seven Free Syrian Army’s fighters due to clashes with SAA across Daraa, confirmed rebel death toll since the 3rd of June is at least 44 fighters. Hayat Tahrir al-Sham’s commander, known as Abu Muthanna, was killed by an improvised explosive device which targeted his vehicle, on the road between Al-Najeh and Al-Lajah. Amaq Agency claimed destruction of a Humvee and death of four Iraqi soldiers due to IS’ snipers in Al-Shafaa district and Bab al-Bayd neighborhood. 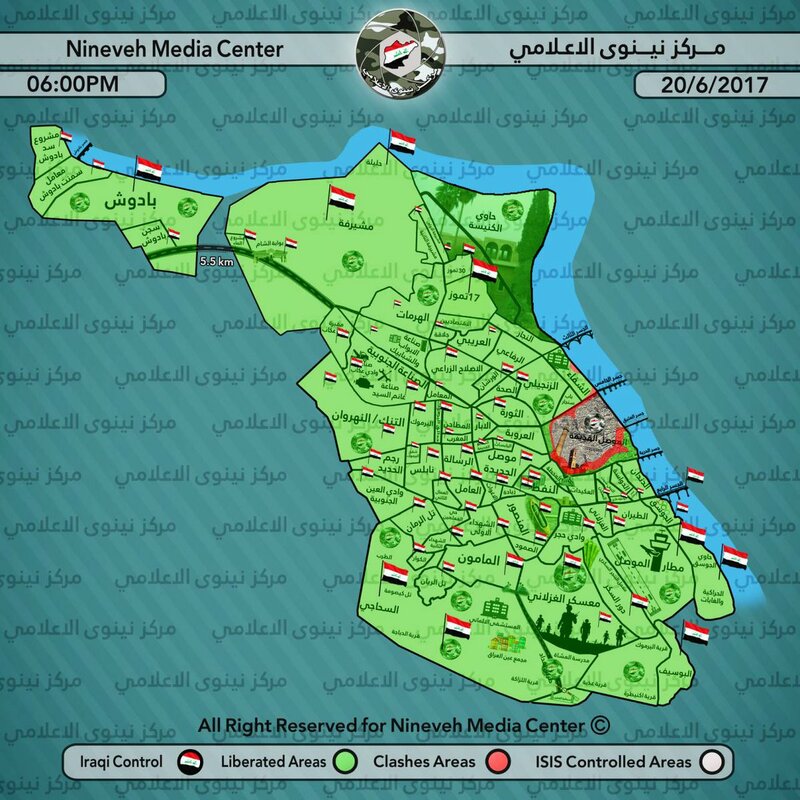 Iraqi forces arrested Islamic State’s announcer and program presenter in the group’s radio station, Al-Bayan. Alaa Sami al-Khatib was arrested in east Mosul in Nabi Younis district after locals informed security forces about his location. One of the three French citizens injured in Old Mosul by an improvised explosive device yesterday, died today. Reporter Stephan Villenueve was accompanying Iraqi journalist, Bakhtiar Haddad, who also died. Islamic State’s Amaq Agency reported death of three and injury of two Peshmerga fighters in Jabal Rebida area, west of Hawija. On the 19th of June 2017 CJTF-OIR has conducted eight strikes in Syria. CJTF-OIR‘s main focus in Syria at the moment is Tabqa-Raqqa-Deir al-Zour region where they did eight strikes supporting SDF‘s operations against IS destroying 15 fighting positions and a vehicle. Islamic State’s improvised explosive device reportedly assassinated a judge and wounded two of his aides in Shish Bagh area, Jalalabad. Yesterday, in Lath Band area, Nangarhar province, Islamic State killed an Afghani soldier. Islamic State launched an attack against Afghan National Army in Darzab district, Jowzjan province. IS reportedly captured seven Afghan National Army’s position, killed eight Afghan soldiers and captured two more. Amaq reported death of seven Filipino soldiers due to clashes with Islamic State’s groups in Baling district, Marawi. According to Phillippines’ authorities, 258 IS’ fighters and 65 Filipino soldiers were killed in clashes in Marawi.